HERCULES AND THE CAPTIVE WOMEN (also known as HERCULES CONQUERS ATLANTIS) is one of the best Sword & Sandal films ever made. It's big, colorful and very fun. If Frederico Fellini had directed an action film, it would look like this. A lavish Technicolor and Cinemascope spectactular, the film was shot in 70mm in 1961, but not released in North America until 1963. The movie has the look and feel of a giant summer blockbuster. With its obviously huge budget, massive sets, incredible miniatures and special effects way ahead of their time... HERCULES AND THE CAPTIVE WOMEN is at the top of most lists as the definitive Italian action movie. Hercules is played by Reg Park, who not only looks the part, but his sincere performance adds a great deal of depth to what would otherwise could be a two dimensional character. The rest of the cast is excellent too... including Fay Spain as the evil Queen of Atlantis, Ettore Manni, Mimmo Palmara and the beautiful Laura Efrikian, who's a revelation here. 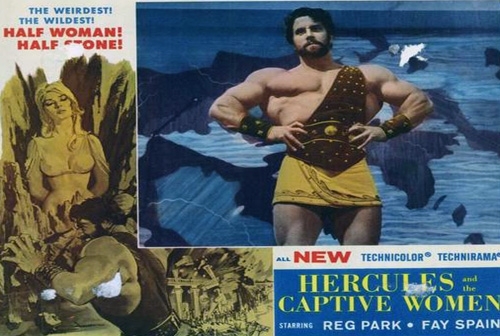 All in all, HERCULES AND THE CAPTIVE WOMEN is highly recommended Peplum!